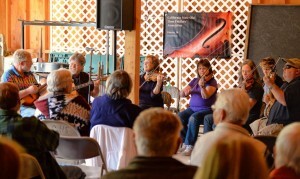 The First Sunday Fiddlers’ Jam returns to the Ely Stage Stop on June 1. The fun begins at the museum at 11:00 a.m. with the Fiddlers playing in the barn from 12 noon through 2 p.m. Donations will benefit the Ely Stage Stop and the Old Time Fiddlers Association. Come early and check out the latest museum acquisitions and displays. During June the main house showcases a quilt display loaned by Wilma Taylor and Victorian style beaded flowers and jewelry created by Ellen Dills. Select beaded pieces will be available for purchase with a portion of the proceeds benefitting the museum. As a result of the first overflow, standing room only, wonderful Sunday Fiddlers’ jam at the Ely Stage Stop and Country Museum in November, 2013, steps were taken to ensure an even greater success for future first Sundays jams. Volunteers secured additional chairs; we got our beautiful picnic tables from the Konocti Conservation Camp; a tractor provides hay ride transport between the barn and main house; and good word of mouth advertising with local media support has ensured that the audience continues to grow and overflow. The Ely Stage Stop has proven to be the perfect venue to foster community interest and appreciation for the California Old Time Fiddlers’ Association’s music. This free, family friendly event can be enjoyed by all, young and old alike. Bring a picnic lunch to enjoy on one of those beautiful picnic tables. 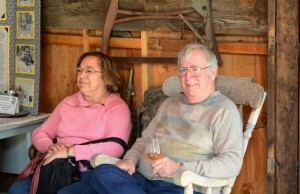 Enjoy the music with beverages and tasty treats provided by the docents. Bring your own wine and sip it in Ely Stage Stop wine glasses that are available for purchase. Come ready to clap your hands, tap your toes, and get up and dance! The stage stop, operated by the Lake County Historical Society, is located at 9921 Soda Bay Road (Hwy 281) in Kelseyville. Our beautiful new sign will greet you. Current hours of operation are 11:00 a.m. to 03:00 p.m. each Saturday and Sunday. Visit www.elystagestop.com or www.lakecountyhistory.org, check out the stage stop on Facebook at www.facebook.com/elystagestop, or call the museum at 707-533-9990. Pick up tickets for the June 14 Ely Picnic on the Porch.